Yet it’s more than just relief. After being bombarded with so many new and different sights and experiences in another country, I find myself wondering how a foreigner visiting my home town would see these familiar streets and buildings. In the same way that I was charmed by La Roque’s storybook architecture and impressed by the Amphitheatre in Arles – things that those towns’ citizens walk by each day without a thought – would a visitor to Seattle be intrigued by construction cranes on every corner or dazzled by the bright yellow sheathing of new buildings going up? 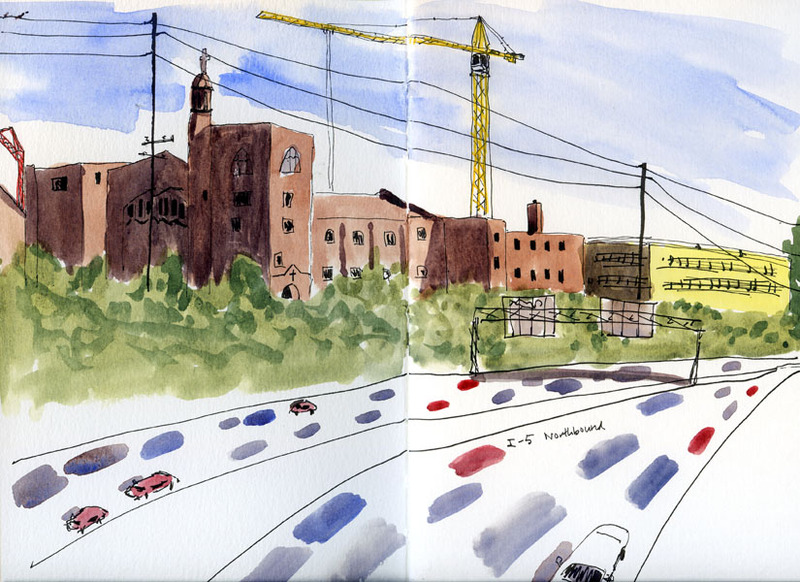 This sunny afternoon I walked out on the Northeast 70th Street I-5 overpass and faced east. I could see the Calvary Christian Assembly Church, the Roosevelt Light Rail Station’s yellow construction crane, a new building with its yellow underwear exposed and (at the far left of my sketch) a bit of another construction crane. Below me, northbound rush-hour traffic on I-5 was noisy, stinky and somewhat nerve-wracking.